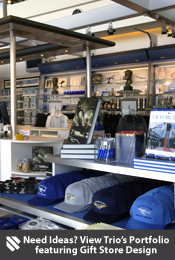 Gift shops typically a wide range of product, and, accordingly, need a number of different merchandising solutions. We carry over 5000 fixtures for the gift shop retailer. Counter-top leatherette jewelry displays, half-vision showcases, poster displays, acrylic bins, pricing guns, cash wraps, point-of-sale systems—we can outfit your gift shop from top to bottom. Our catalog even includes customizable gift bags to personalize purchases. If you don’t find what you need, please give us a call. 1 (800) 454-4844.